and a cold one too, Yikes! Today’s temperature dropped drastically. It was -10 degrees celsius, but with the wind chill, it felt more like -18. 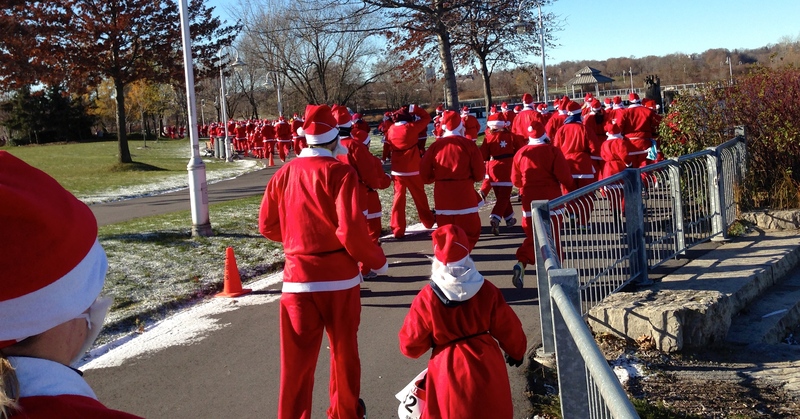 We were heading out to Hamilton to run the Santa 5k. I dreaded running in today’s cold, but the incentive of wearing another layer to my already existing 3 was fuel enough to get me going in the morning. And to add to that, the extra layer was a Santa suit. Woot. When we arrived at the location, we parked our car at the Williams Fresh Cafe where we were able to enter the restaurant to keep warm and use the facilities. It also was the finish area, so we knew we’d have easy access to our car when we finished the race. When we were ready to leave and ride the trolley to the start location by the Hamilton Yacht Club, we had just missed it. Luckily, Kelly from VR Pro was driving over so she kindly offered us a ride so we weren’t standing in the cold. 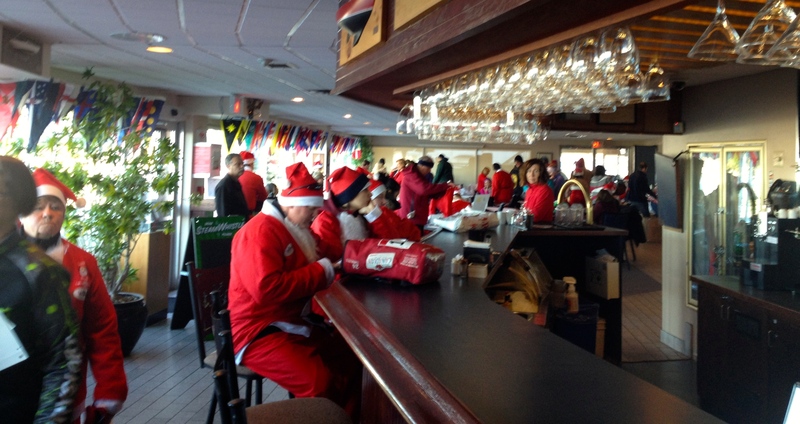 Minutes later, we entered the Yacht Club and picked up our Santa suits. It was nice to be indoors for a change before a race to keep warm, and to relax. Felt so civilized from the regular stand outside routine. We ended up taking our bag of ‘extras’ from the packet pick up back to our car, which allowed us to take the trolley. Oh yeah, we got the full Santa experience! Once we returned to the start location we had about 20 minutes to do any last minute costume adjustments. Kelly got on the microphone and let us know when we should go outside to corral ourselves for the race. 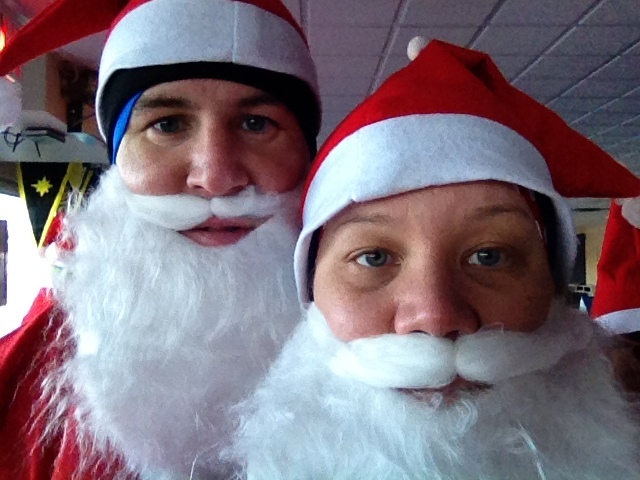 It was fun being dressed up as Santa for the morning. 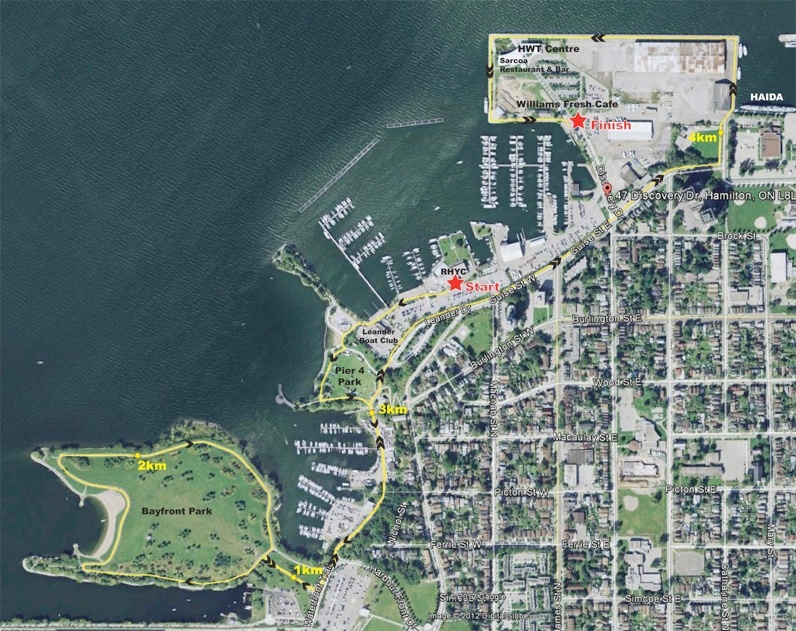 The race took us along the Hamilton waterfront/Yacht club area. There were a few gradual inclines but nothing too extreme. Of course, I over layered and ended up over heating around the 3km mark. (will I ever get it right?) Soon enough we were at the finish, gnoshing on some hot coffee and breakfast sandwiches, compliments of the cafe. Here’s some pics of our adventure. Wait a second…..who’s that? Santa is that you? I really enjoyed the morning. Kelly does a great job at putting together these races. If you are in the area, check out the VR Pro site. 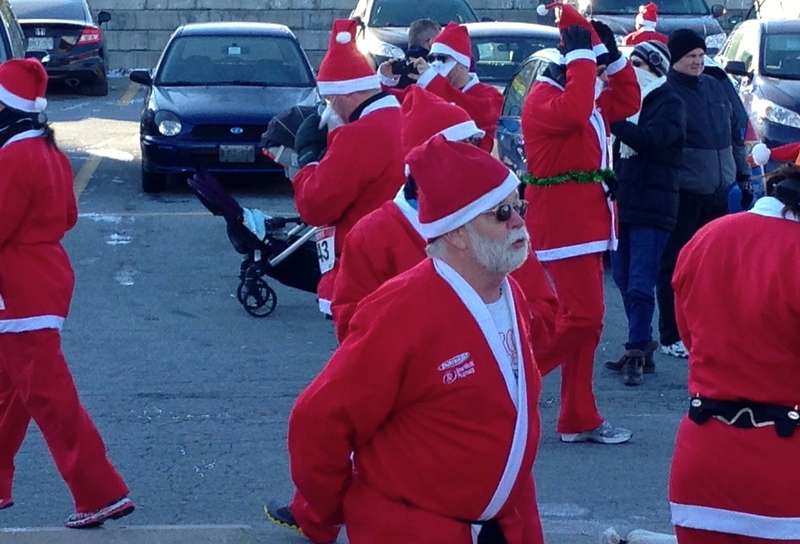 In fact, I hear there’s still room for the Burlington Santa 5K coming up in a couple of weeks.